US President says attack can take place "tomorrow, next week or a month from now." U.S. President Barack Obama said Saturday that he has decided to take military action against Syria, but that he wants this action approved by Congress first. He delivered the message in a special Rose Garden address from the White House. he began with a dramatic description of the chemical weapons attack ten days ago, speaking of "young girls and boys gassed to death by their own government" and calling the incident the “worst massacre by chemical weapons in the 20th century” and "an assault on human dignity." 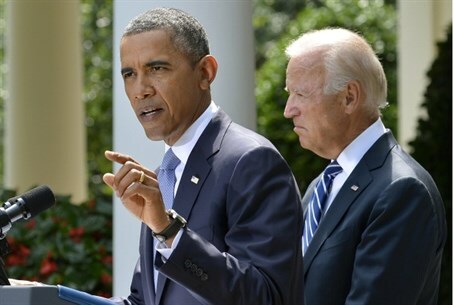 Obama noted that the "atrocity" in Syria "also endangers our friends, including Israel, Jordan, Lebanon and Iraq." "After careful deliberation I have decided that the US should take military action against Syrian targets," he said. The action will be "limited in duration and scope," he explained. the US military "has positoned assets in the region" and the attack "could happen tomorrow, next week or one month from now." However, he said, he also made a second decision: to consult with Congress and secure its approval for a strike before launching one. "I’m prepared to give that order, but having made my decision as commander in chief based on what I am convinced is our national security interest, I’m also mindful that I’m the president of the world’s oldest constitutional democracy," Obama said. "I will seek authorization for the use of force from the American people's representatives in Congress." Obama said he had spoken by telephone with Republican House Speaker John Boehner, Democratic Senate Majority Leader Harry Reid and that they agreed to hold a debate and a vote on authorizing the use of force "as soon as Congress comes back into session." "Today I'm asking Congress to send a message to the world that we are united as one nation," he said. Obama's address seems to set back a military strike by at least 10 days. Congress is scheduled to come back from recess on September 9, and only then hold a debate on the subject of a military strike against Syria. Obama had completed a two-hour-long meeting with the National Security Council before the Rose Garden address. Israeli analysts said over the weekend that the U.S. is expected to attack sometime during the weekend. Israel's Channel 2 reported Saturday evening that Hezbollah has told Lebanese President Michel Ayoun that it has no intention of opening fire on Israel in case of an attack on Syria. Obama's address is apparently meant to convince the American people that the attack on Syria is indeed necessary. This will not be easy: a new Reuters’ poll shows support for intervention has increased over the past week, but only to 20 percent, up from just 9 percent. More than half of Americans oppose intervention. Secretary of State John Kerry said Friday that the administration will try to convince the American public and Congress that America has an “obligation” to act. Members of the House of Representatives are to receive a classified briefing on Sunday from White House officials. Senior Obama administration officials scheduled phone calls with congressional leaders on Saturday as the White House continued to make its case for a military strike on Syria, officials told the Washingtom Post. Secretary of Defense Chuck Hagel and Gen. Martin Dempsey, the chairman of the Joint Chiefs of Staff, were among the administration officials expected to speak to key members of Congress on Saturday afternoon.